Have you ever happened to visit those blogs that show a small summary of each post on the homepage rather than showing the whole post content? If yes, then this has been becoming a latest trend of not displaying the whole content on the homepage or archive page. Blogger offers a feature called After the Jump which makes your large posts appear in the form of small post summary with a read more link that leads you to the full view of the post. 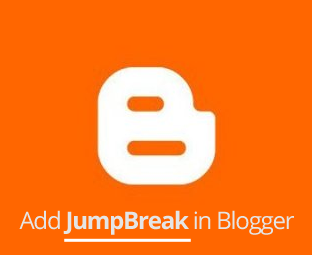 In this article, we will show you How to Add a Page Break/Jump Break in Blogger. 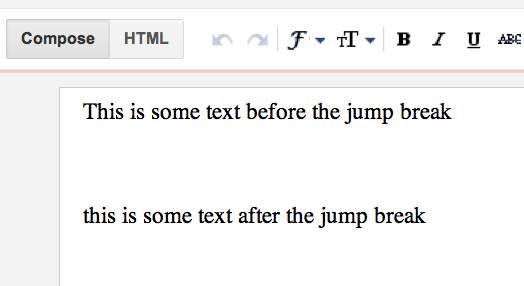 Why to use Jump Break/Page Break? It helps you to reduce the bounce rate of your blog because visitors now have to click on the read more link to view the whole content. This also means that you will get 2x more pageviews than you were getting previously. Since, a lot of people are using this feature on their blogs so you should try it too. In short, it has been the latest standard for all personal and magazine based blogs. How to Add page break/jump break in Blogger? Adding a page break in your post is very simple and can be achieved with ease with the help of post editor, without even adding any extra code to your site. The very first thing you need to do is to go to Blogger >> Edit a Post >>. Now you have to decide where exactly you would like to place the jump break in the content and place your cursor at that location. Once you have successfully placed your cursor on a location, click the Insert Jump Break toolbar icon in the toolbar. Now you’ll notice a gray bar separating your content. This illustrates that how your post summery would look alike. Your post summery would consist of the text that starts from the top till the jump break line. Once you have successfully placed the jump break, you are good to publish your posts and that’s it. Now you’ll notice a read more link along with the post summery. Now your visitors have to click on read more to read the full post. We hope this tutorial may have helped you in learning how to add page break/jump break in blogger. If you are using read more in your blogs then, let us know what are the results. We are also using the same technique at MyBloggerLab and the results are pleasing. Why Jump Break in Blogger no working?